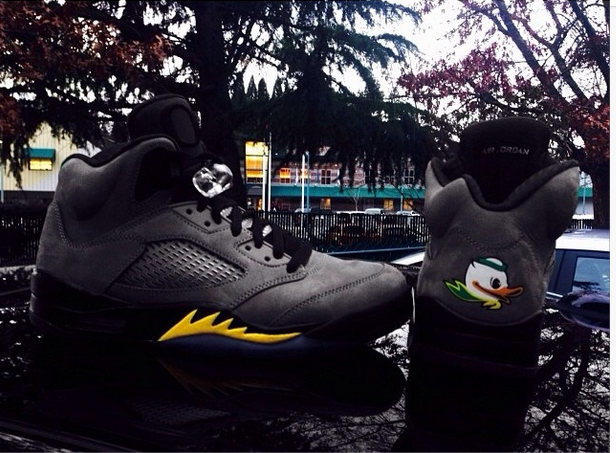 Today gives us the very first look at a brand new Air Jordan 5 team colorway for the Oregon Ducks. Much like the Green “Home” colorway, the shoe features hits of Yellow on the Black midsole, along with the signature “Puddles” duck mascot stitched on the rear. Judging from the image provided, this Jordan team exclusive sticks with a Black tongue and icy Blue outsole, only this time with a Grey suede upper instead of the previous Green. While there is currently no information in regards to whether or not the shoe will remain an Oregon exclusive or a possible Jordan limited release, keep it locked to KicksOnFire for the latest updates on the Air Jordan 5 “Oregon Ducks” Away.